Confused or intrigued by the phrase ‘Light Tricks’? Well step inside and let us cure that curiosity with our 5 quick light tricks that you can master in just one day! Light Tracing – the art of tracing around an object, with light! If you’ve seen examples before of this light trick, then you’ll know it’s a visually stunning way of re-creating the form of any object. You’ll amaze yourself by how easy it is to make a simple household object look futuristic! All you need is an object with a distinctive shape – headphones, bicycles, flowers or a toaster for example. It’s best to get behind the object as opposed to in front. The camera needs to see the object constantly so find a decent space to work in and make sure it’s fairly dark. 2 Second Tip – Don’t choose objects that have narrow outlines such as forks, it’s hard to trace the outline precisely. It depends on the size of your chosen object, but a shutter speed of 30 seconds should be more than enough. When tracing small objects use a small light source such as a laser pen or penlight. However, you may need to go bigger with larger items and use a torch or smartphone light. Above all, make sure there’s enough battery life in it! 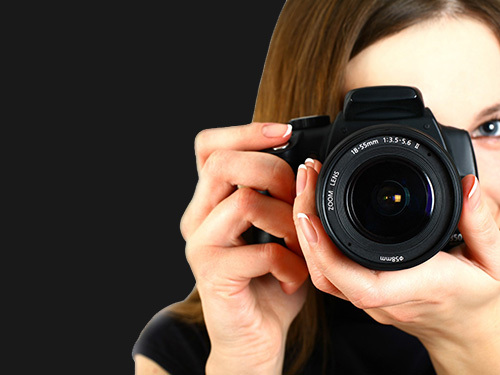 Steady the camera, keep the ISO low (200 max) and use shutter priority mode so the aperture is taken care of. But if you prefer to use manual mode then start at f16 and adjust depending upon your results. You may need to do this a few times. When the camera is ready to go, hit the shutter and start tracing the outline of your object. Make sure you keep as close as possible to the actual outline. Finally, try to follow all the curves and shapes to ensure your tracing has an obvious result. 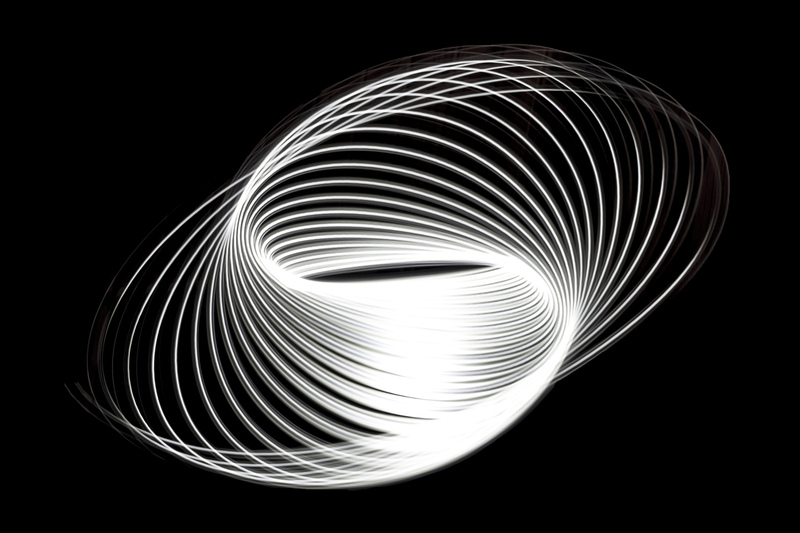 Although the name sounds highly scientific and complex, Physiograms are actually rather simple light tricks. Start by attaching a long piece of string (approx. 1 meter) to a small laser pen or finger light and pin (or securely tape) it to the ceiling of a dark room. Mount your camera to a tripod beneath the light, and tilt it 90 degrees so it’s looking upwards. Remember to turn the light on and set the focus. Next, switch your camera to shutter priority mode (or manual) and slow down the shutter speed to around 10 seconds, to begin with. When you are ready to start, push your dangling light so it starts to swing. The first few movements may be a little chaotic but as soon as they regulate, begin your exposure. The effect of the light moves in a pendulum-like motion, slowly progressing to different directions as it slows. Consequently, this will give you a consistent and equal path of movement. It looks a little like the old Spirograph toys that we used to see in the 80’s & 90’s! You can manipulate the shape of the Physiogram by changing the force and direction of your nudge. Each exposure will be different from the next. Because the camera is low down and pointing at an awkward angle, flip out your LCD screen, if you have one, to help save your back! Physiograms take on the look of a futuristic science illustration. It will certainly impress any audience given the simplicity of the original trick – especially since it’s a great project to try at home. If you need to improve the contrast or the saturation of your light trick after the shot has been taken, then don’t be afraid to make those adjustments in post-production. There’s nothing more magical than capturing the reaction of a child, or a really excited adult opening up a surprise gift. It’s that expression above anything else that will make this next light trick a brilliant idea to try out. Find a box, and if it’s not already, decorate it with some wrapping paper to make it look like the perfect gift. Make sure it’s easy to open, with some loose flaps or a lid so the light inside can be seen clearly. Place a bundle of battery-operated fairy lights into the box (similar to Christmas Tree lights). As a result, the more lights the better as they will make the effect brighter. 2 Second Tip – Make sure not to fill them to the rim, you don’t want them visible in the final shots – use blu-tac to hold them down. White lights are best, as they’re going to be illuminating your subject too. 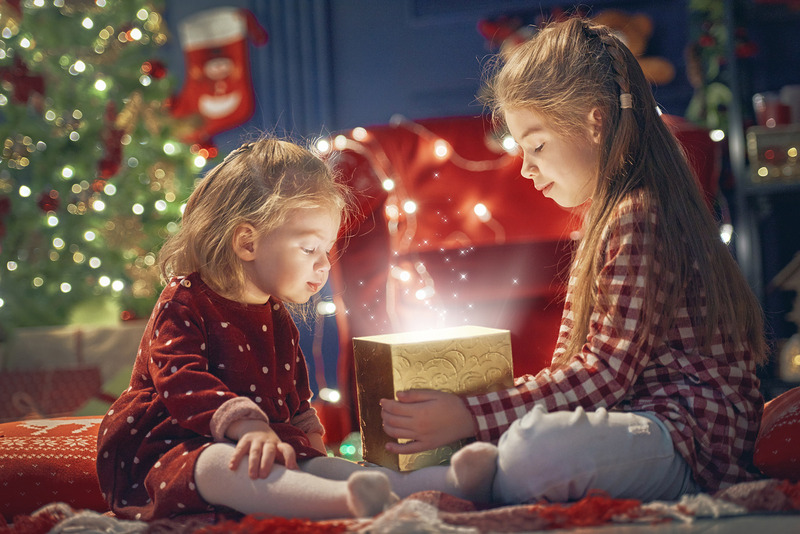 If you decide to place an actual present in the box too, remember the first seconds of their reaction is the most genuine. It could be a good idea to switch to continuous/burst mode just for those moments. The lights in the box will illuminate their face, offering a soft glow emitting from the box as if they’d opened an amazing treasure. This looks perfect with children as it adds a magical feeling to the atmosphere. It’s best to give a child a smaller box to hold so they can manage to bring it closer to their faces, otherwise, the shot may be a little too dark. You’ll need the surroundings to be dark, so it doesn’t overpower the glowing box. Open up your aperture as wider as you can (f5.6 or wider) to create that sumptuous shallow depth of field. Keep the ISO below 400. If you want to step up the creativity to this light trick then apply the same process to opening large books, or even add in some coloured fairy lights to add a bit of ambence to the shot. Although this technique may sound more like a relaxation therapy rather it is actually a chance to make some art. Nevertheless, milk baths create a great opportunity to add serenity and peace into the trickery of your portraits. The first secret you need to know, despite the pictures, you don’t need to fill up your bath entirely of milk – imagine the cost! Instead, just use water and then pour in a pint of milk at the end. The more milk you add, the stronger the white will appear. A bold, white, watery background can provide the perfect blank canvas to any portrait. Ask your subject to lie in the bath side on so you can see the shape of their body cutting through the white canvas. Make sure their dignity is intact too – if you know what we mean! ? They will need to remain still for a while to let the milky water settle so there are no ripples of movement in the liquid. By asking them to close their eyes, the image can look a lot more peaceful. Using a warmer temperature of water, you can introduce a misty element with the steam it will emit – though watch out for condensation! Contrast is the key to a successful milk bath photo, so use colours that aren’t white or pale in addition. Think about using darker hair colours, bright red lipsticks, bold eyeshadows or if you want to go further then throw in some props. Flowers and petals are a beautiful feminine touch to this already angelic technique. Shower your subject with floral delicacies around their body to increase the contrast in colour. On the other hand, one lone flower can work too; a rose to match red lipstick is a striking combination. It’s important to remember which colour you are using as this will hold the emotional narrative to your image. Reds are romantic, blues are formal, yellows are alarming, and oranges can look exciting – choose your colours wisely. 2 Second Tip – Remember to remove any flowers from the bath before you drain it, or you’ll end up with some serious clogging! Remind your subject to shower off as well – no one wants to smell of milk, unless you’re an infant! We’ve left the most impressive (and possibly most dangerous) light trick till last – got to build the drama right?! 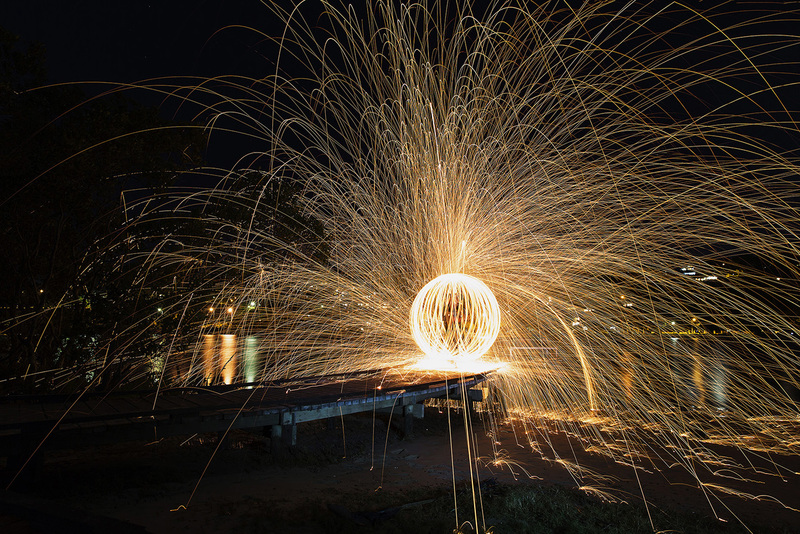 With wire (or steel) wool photography choosing the right location is key. Likewise, aim to ensure you have enough space around you as you’ll be playing with fire ultimately. Look for big spaces like parks, fields, scrubland, empty car parks, beaches, disused tunnels, desolate roads, in a lake or even the sea – if you are feeling brave and adventurous! Employ a very willing and competent assistant to help you in this situation, make sure they are sensible and reliable (no children). Make sure everyone involved is covering their body as much as possible – especially your assistant. Also, they will need to be clothed in black head-to-toe – hats, gloves, boots and even goggles. 2 Second Tip – The best type of steel wool to purchase is called ‘fine’ or ‘extra fine’. This is probably easiest to find at your local DIY store. Once you’ve got your wool, you’ll need a ‘cage’ to keep it in. It needs to be metal (to withstand the heat), so something like an ordinary household whisk would be perfect. A whisk is also a useful tool because it has a long handle, meaning you don’t have to touch the cage after it’s been burning. Next prop we need is a dog lead, but don’t attach a dog. Instead, clip it to the hook on the end of your whisk, this will help keep the burning wool away from your assistant’s face. Don’t forget to take a tripod and 9v battery with you too – we’ll explain why in a moment. Once you’ve got all your props ready, you’ll need to stuff the wire wool into the whisk. Make sure you break up the wool, so it appears fluffy. The looser the wool is, the more sparks will be produced, as air can pass through easier. Mount the camera on a tripod and choose shutter priority. Reduce your shutter speed to 15 seconds, but change this based on your results. Just before you’re ready to start shooting, ask your assistant to rub the 9-volt battery on the wire wool and it will start to ignite (more like a slow burn). Once it’s happily glowing then get into position and ask them to start spinning the wool around their head like a lasso. Make sure you start the shot after they’ve begun spinning otherwise, you’ll get awkward shapes. You may need to try out this shot a few times, but don’t be afraid to change up the angles and direction of the spinning. 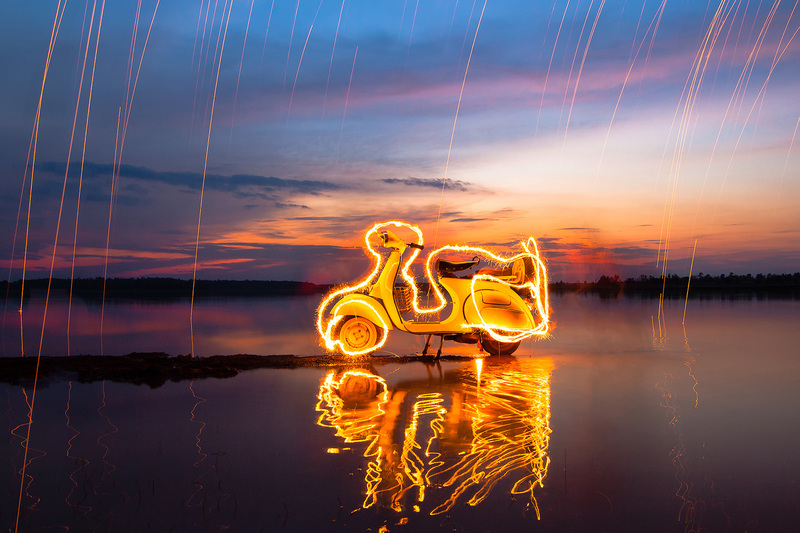 As a result, the long exposure and flying embers will illuminate your surroundings giving a sense of space and location. It’s a brilliant effect to shoot at sunset for those warm colours. Safety is paramount when working with wire wool, so keep a bucket of water or sand nearby in case of any accidents. Remember to bring extra wire wool too, you can’t reuse it once it’s burnt! Well, we hope our 5 quick light tricks have inspired you to take on some brand new approaches to using light in your photographs. If you’re not already a student of the Light Tricks Course then join here! If you want to read more brilliant photography guides like this then check out the rest of our blog collection and don’t forget to like us on Facebook, follow us on Twitter and Instagram!